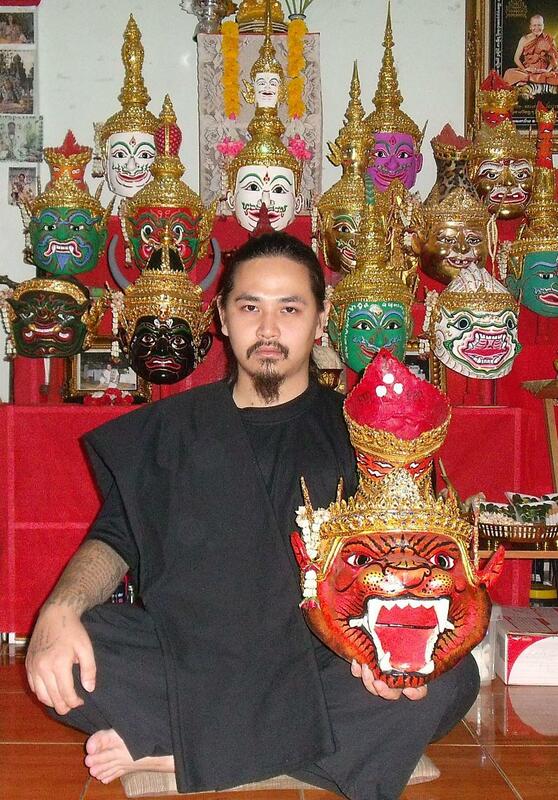 Ajarn Ves Ruesavet is one of the rising stars in Thai Occult practice. His amulets are growing in popularity due to its efficacy. Ajahn Ves was born in Udon Thani Province North Eastern Thailand. His interest in Buddhism bloomed at a young age, he was able to keep the 8 precepts even through the difficult teen years. AJ Ves had a bourgeoning desire to get involved in Thai Wicha at a young age. He pursued his dream relentlessly and sort out Magick masters in Cambodian magick called Dhamm Kao Kot, he also seeked out current Lersi practitioners deep within the depths of the Isan province jungles. 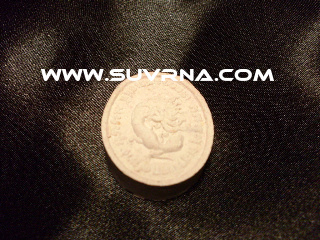 He for 8 years under the tutelage of various magick masters including Kruba Subin. He picked up the art of Sak Yant in Kalasan Province and learned how to create amulets in the Mahasarakam Province, he also learned to call ghosts and spirits from these masters. 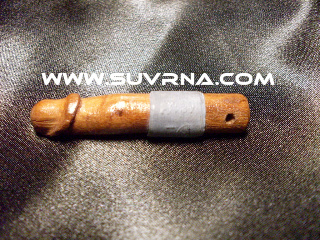 Recently over the last couple of years he is growing in popularity as his amulets are receiving rave reviews. He is growing in popularity and is steadily becoming one of the best Ajahn’s of today and tomorrow. His followers come as far aways as Taiwan, China and he has even been to Hong Kong to perform Sak Yant (Spiritual Tatoos) on his followers. The word on the street is that Ajahn Ves Reusavet is an up and coming spiritual master who has not succumbed to materialism but yet is powerful and who’s reputation is steadily growing. A friend of mine found his location and contact and so we were on a mission to seek him out during this trip to Thailand. I have seen my share of Ajahn’s in Thailand from those that are more materialistically driven and try to squeeze as much as they can from foreigners to those that are still practicing with the value system of yester years truly dedicated to their art, charging reasonable prices or what one can afford. The later becoming increasingly difficult in today’s materialistic Thailand and almost seizing to exist. The first thing that striked me about AJ Ves was his age, he looks relatively young and hence I did not expect much but only through my personal experience with him did I realise that he was not only very powerful but operated by the old ways and told us to donate what we can for his service, note that his seldom happens to “farang” foreigners, we are usually the ones that paying special higher prices but this man unlike others made us feel right at home and we donated as generously as we could. Ajahn Ves has a cheerful demeanour and was very welcoming. We sat down and started to chat for a bit with AJ Ves. As I was drawn to his amulets our conversation turned in that direction. He was forthcoming in explaining about each and every amulet. He was able to even speak some English which is quite rare in Thailand and made it even easier to discuss the nitty gritties about the amulets. He explained how some of the amulets received overwhelming feedback from his followers and also which amulets were best for which purpose. 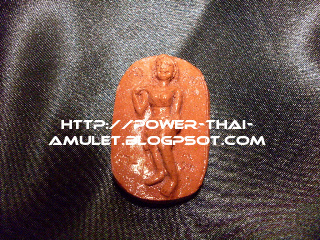 The Mae Per amulet has had many experiences, also his palakid amulet has established a name amongst many. He related stories of his followers as far away as China and Hong Kong, who had contacted him with powerful results. 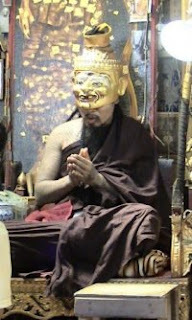 I appreciated his dedication to his work, the moment I decided to rent some amulets on behalf of people, so that others too can experience his amulets. He straight away got on to the process of blessing the amulets intensely and called upon the spirits to follow the amulets (photo above). This Ajahn was dedicated and spent different quite a while praying with the amulet before he allowed us take the amulets. During his blessing ceremony I could feel a cool wind blow in that area where we were sitting and we didn’t have any open windows. Anyway when he finished he handed the amulets to me and gave me the kathas and instructions. When I touched the amulets I could feel them vibrate and heat up in my hand. That was it ...at that point I told my friends ....”this guy is the real thing” ....he encompasses all the characteristics of a true master. I then decided at that point that I had to at least get one Sak Yant from him or even a several but I decided to do two on this trip. He did one by hand using the Mai Sak which is the traditional way and the other using a tattoo gun. After my offering at the altar was complete, he gave me a mantra to chant in my mind with every breath in I took, this was to be done during the tattooing process. I started with the Namo Tassa katha x 3 and then chanting this mantra in my head as directed. After he completed the tattooing process he started with the chanting and blessing, he took longer then most other ajahns and intensely concentrated on what he was doing. I made the sak yant on my right thigh and about 1 minute into the blessing process I felt my whole thigh and leg went numb and my muscles started to cramp up and it gradually spread to my lower stomach muscles, the feeling was intense, I was actually taken aback for a minute from the intensity. Anyway, that was just my personal experience. Below are some of his amulets for rent. Spiritual Power: ***** (4.5/5) Very powerful, he is multi talented and is also an expert in strong magical practices. Quality of Sak Yant, ie line quality, design, shading: ****(4.5/5) If he uses the tattoo gun his work is excellent, lines are thick and look awesome, just as good a western tattoo, power felt is just as good as Mai Sak. Using the Mai Sak though, might not be his forte, yet. Kho Haam (Rules of conduct for Sak Yant): 1) No sexual misconduct (meaning do not sleep with someones wife knowingly) 2) Do no insult parents 3) Do not spit in toilet bowl. 2) Improve and maintain good trading, business & career development. 3) Strong Charisma always and luck in gambling. 4) Ensures a steady flow of money. 5) Ensures safety during travels and helps one to escape from danger. Business & dealings with people at work hence career development. 1) Bringing forth success in ones life, assist in changing bad luck to good luck.